You might be interested in my radio report on the General Assembly. I volunteer at KBOO, 90.7 and the station ran my report as a "News In Depth" piece on June 25th. I spoke with Rick Ufford-Chase of the Presbyterian Peace Fellowship, Jeffrey DeYoe of the Israel-Palestine Mission Network, Nahida Gordon, author of Palestine Is Our Home, Ray Bagnuolo of That All May Freedly Serve, Michael Zimmerman of the Clergy Letter Project, and our Stated Clerk, J. Herbert Nelson. It is an entertaining 13 minutes from a progressive perspective. I have an interview with Rick Ufford-Chase coming up next week about his book, Faithful Resistance: Gospel Visions For The Church in A Time of Empire. You will be happy with yourself if you subscribe to the Progressive Spirit podcast via iTunes or your favorite app. The General Assembly was fun. Several members of Southminster participated in the mass choir and many more volunteered throughout the week. Nice to host folks in Portland. We hosted about 40 General Assembly participants for worship and a vegetarian potluck on June 19th. Patricia Tull preached a powerful sermon regarding Earth Care. At the GA, I was tickled that evolution passed the assembly. The General Assembly overwhelmingly approved the Clergy Letter Project. I didn't even think it would make it to the assembly, so to have it so well-received was most gratifying. “Allah bless us and bless our families and bless our Lord. Lead us on the straight path – the path of all the prophets: Abraham, Ishmael, Isaac, Moses, Jesus and Muhammad. Peace be upon them all Amen. I am proud of the PCUSA for choosing Mr. Said to offer this prayer. It is an important move toward peace and a fulfillment of the PCUSA's Interreligious stance that was approved in 2014. I am pleased to have served on the committee that worked on that stance in Detroit. The most gratifying event happened the weekend the assembly started. 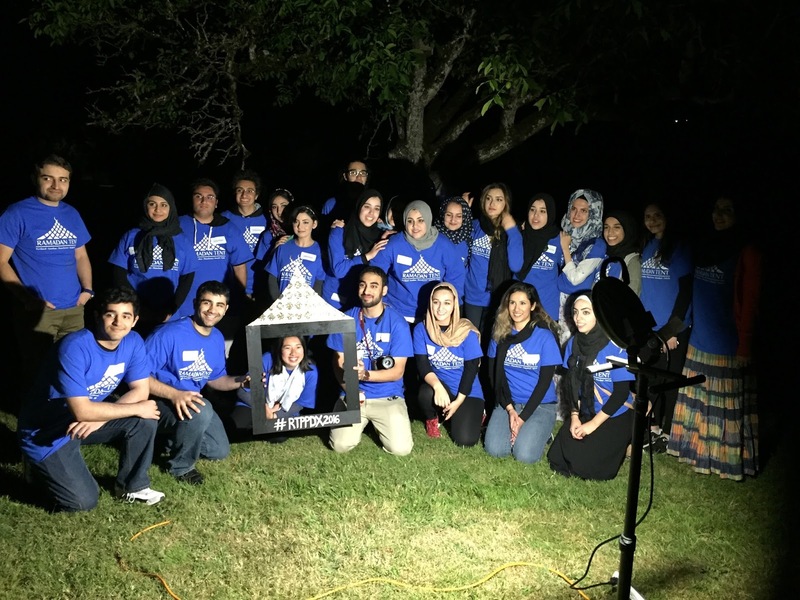 Southminster hosted the first ever Ramadan Tent Project in the United States. In our backyard. 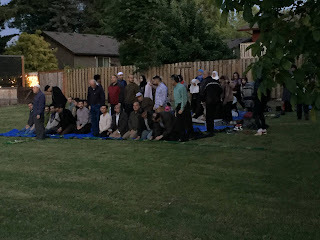 It was an Open Iftar for three nights, June 17, 18, and 19. We received nice press coverage by newspaper prior to the event and KATU Channel 2 news afterward. The Facebook site, Ramadan Tent Project Portland has some great pictures. Across the street from my congregation is the Islamic Center of Portland. 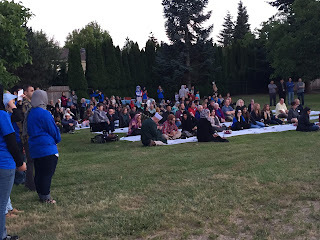 It is the only Shia masjid in Portland and we couldn't ask for better neighbors. They invited us to celebrate the birthdays of Mohammad and Jesus (PBUT) in December. They overwhelmed us with hospitality (and food!). On Earth Day, we invited them to a vegetarian potluck that we provided to discuss how our differing faith traditions inspire us to care for Earth. My predecessor at Southminster, Peg Pfab, is on the board of the human rights council of Washington County. She contacted me about some college students who were looking for a place to host the Open Iftar. I contacted the leader, Sadaf Assadi, and we got the ball rolling. Sadaf Assadi spearheaded the effort. 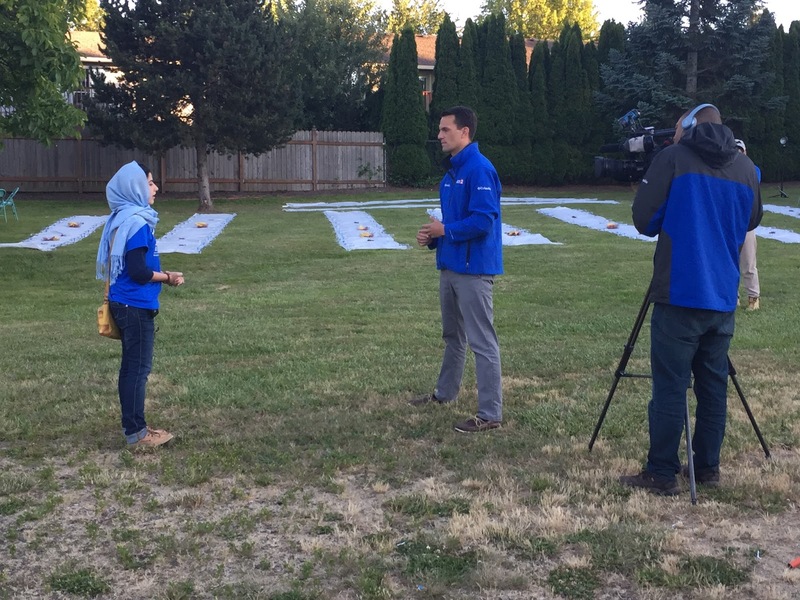 Here she is speaking to KATU. To begin each of the three evenings, we gathered first to listen to speeches. 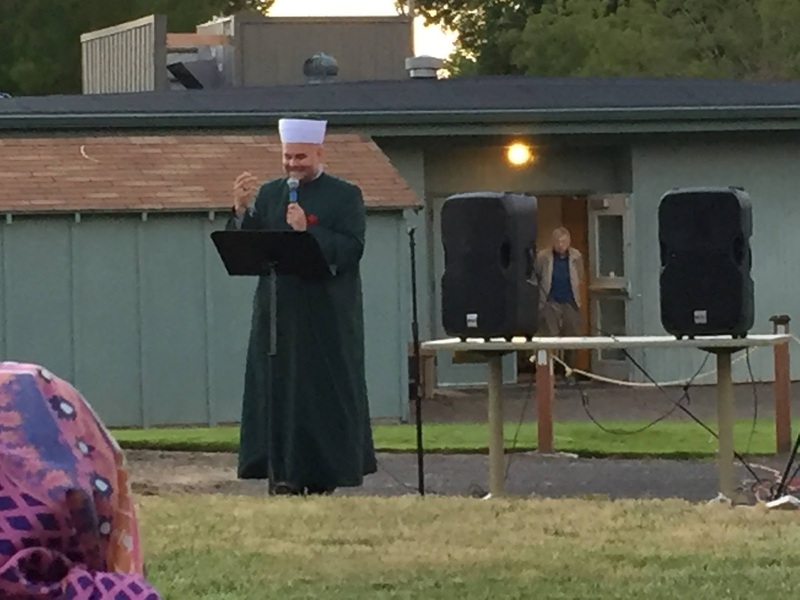 On the first night we heard from Imam Abdullah Polovina about peace and unity. 200 people attended each night. After the speech, there was a call to prayer. It was so beautiful to hear this prayer ring out into the neighborhood. The Sunnis and Shias pray at slightly different times. Here are the guidelines for when the sunset prayer or Maghrib happens. Even as there were two different times for prayer many Sunnis and Shias and non-Muslims prayed together. 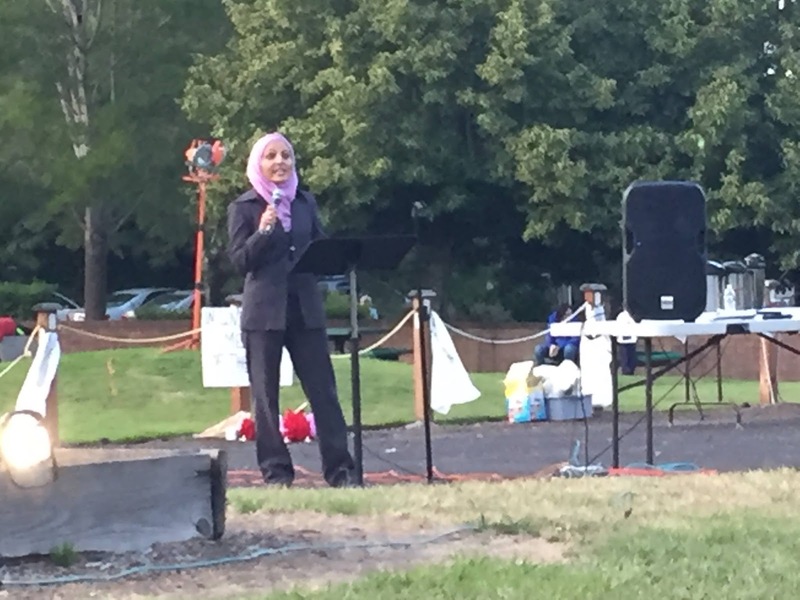 I was humbled to stand shoulder to shoulder with them in prayer that was an inter-faith and an intra-faith event. Here is a photo of Sunnis, Shias, and several non-Muslims participating in prayer on the church lawn facing the Kaaba in Mecca. 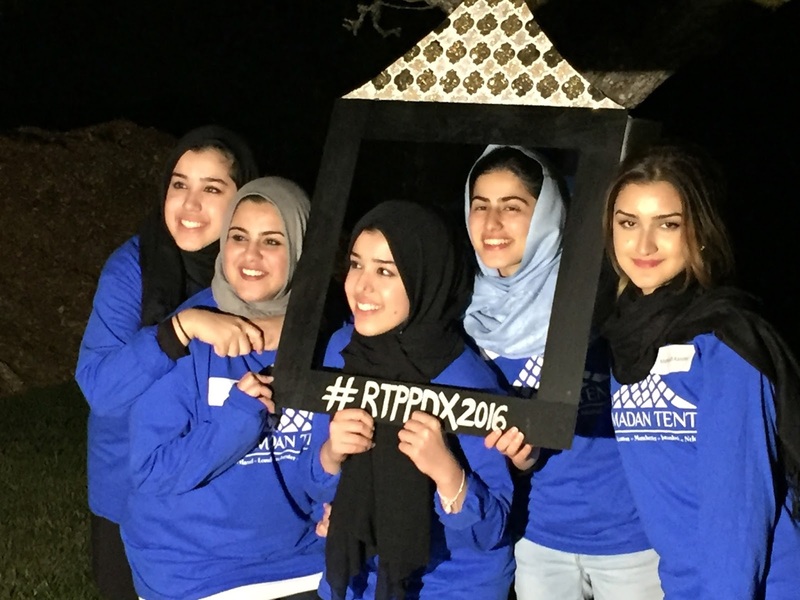 While breaking bread, Muslims and non-Muslims shared stories and learned about one another. 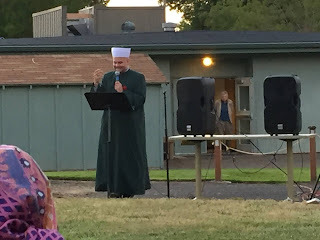 I was even honored by being asked to speak on one of the evenings. Here is the talk I gave. Here is a picture of some of the amazing students who organized it. The entire group! They provided the food from various restaurants. It was fantastic! 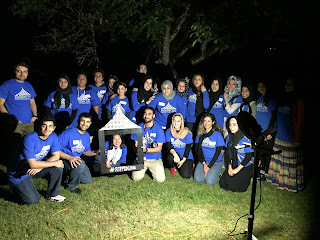 On night three, Aneelah Afzali spoke about the importance of getting to know Muslims to counter the organized, well-funded efforts to demonize Muslims and to divide us. This was one of the most profound events in which I have participated. 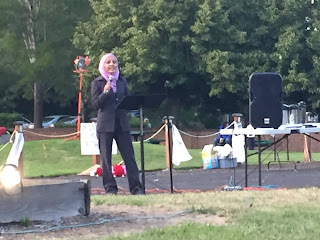 I hope Southminster will participate again next year and I look forward to other inter-faith events with our Muslim friends. What a great report!!! Thank you so much for the email alert!!!! Thank you, Elizabeth and Ray!